I want to thank Mary Buckham for going above and beyond with her “takeover” of my blog last week. She did a phenomenal job answering questions and replying to comments—in addition to her great posts on improving our setting descriptions through deep point of view and anchoring our scenes. And congratulations to Amanda and Serena for their wins in Mary’s giveaways. Yay! My workshop went well and I attended several fantastic sessions, so I’ll be sharing additional thoughts in the upcoming weeks. But for now, I need a topic I can fake being coherent for in a short post. *grin* Then I can return to being brain dead for another day or two. My regular readers know I’m a perfectionist, as I’ve mentioned it many times, but I try not to let it hold me back. After all, logically I know perfection is impossible. So every week I manage to publish blog posts and share my work with others despite its flaws. However, facing various choices and issues in my writing career has forced me to recognize that sometimes I do suffer from a related fear. And that fear does hold me back. The drive for perfectionism can trigger a fear of failure. I would bet that I’m not alone with this dual whammy of issues. While I don’t let my perfectionism hold me back in day-to-day life, I struggle when facing choices: What if I choose “wrong”? In writing, it might be a fear of writing our genre wrong, or writing the wrong kind of character. Or maybe we worry about whether an agent or contract is wrong for us. Or maybe we fear the publishing path we’re on will flop or that we’re too late to the game to find success. In short, this fear of doing things “wrong” can paralyze us from making any choices at all. That paralysis is what’s really wrong. Bestselling author Sylvia Day was the Keynote Speaker at the RWA Annual Conference, and one of the themes of her talk was the danger of failure and fear. She pointed out that not only does fear of failure hold us back, but it also prevents us from learning from our mistakes. Sure, we might choose “wrong,” but very few mistakes in our life won’t come with a lesson we can take away for the future. With each new book, we can experiment with our writing techniques. Maybe an agent is “wrong” for us, but we can change agents. A “wrong” contract doesn’t prevent us from writing new stories for new options. Self-published authors can change books covers and blurbs if they turn out to be “wrong” for attracting readers. Even a choice of a publishing path doesn’t have to be permanent. Plenty of authors have gone from traditional to self-publishing and vice versa—or found a middle ground with hybrid publishing. If we make a choice and it turns out to be a mistake due to one thing or another—and we learn from that mistake—is our choice really a mistake? The problem isn’t with making mistakes. We all make mistakes every day and can’t avoid that fact. Living life without mistakes is just as impossible as living life perfectly. The problem is only if we don’t learn anything from our mistakes. It’s only by “failing” to receive “everything is perfect” feedback that we learn how we can improve our writing. It’s only by receiving rejections that we learn which agents aren’t a good fit for our work. And it’s only by trying that we’ll learn what doesn’t work. We see this in the rest of our life too. We often need to date several “not right for us” people to learn what we don’t want in a life partner. Or we might have to try a class in school to learn the subject isn’t nearly as interesting to us as we thought. Writing isn’t any different. 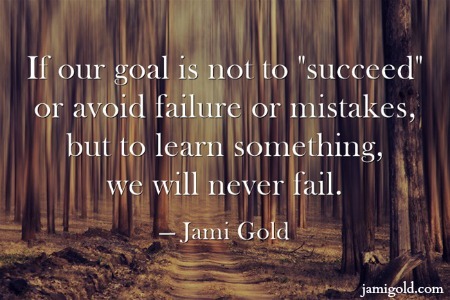 It’s only by “failing” that we learn. But that truth means failure has value. If failure teaches us something, it’s not strictly a bad thing. Do you agree that a fear of doing something wrong is related to a fear of failure? 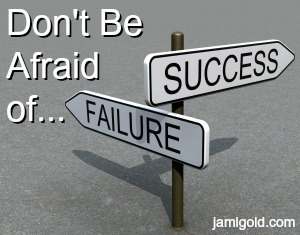 Do you struggle with the “what if I do something wrong” style of fear of failure? Can failure have value? Do you think it’s always possible to view failure as a learning experience? And if not, what makes that attitude difficult or impossible? Do You Belong? Or Are You a Fraud? My motto after last week – The key is the write the best book I can, put myself out there, and learn. Everything else will happen as it needs to. Yep, I’m known for over-thinking things, so I completely understand. LOL! But you’re right that the gist of the advice we heard last week–over and over–was to write the best book we can and to do the best we can when putting it out there. May we all remember that. 🙂 Thanks for the comment and good luck! I agree with your statement that a fear of doing something wrong is related to a fear of failure. That can be stifling and put you on a never ending circle. I try to take the path of courage and am thankful for the cheerleaders I find on the sidelines. Yes, “stifling” is a good way to put it. You’re so right that courage and cheerleaders help. 🙂 Thanks for the comment! You must have been picking up my vibes when you wrote this one. I have been writing-ah-hem, rewriting the same novel for longer than I care to admit. Going back and changing the beginning, changing the premise, changing motivations. I’ve changed just about everything in the story except for the characters’ names, and I’ve been tempted to do that. It is the fear that I have chosen the wrong starting point, or the wrong situation, or the wrong anything that has muddied my once coherent, if imperfect, MS and changed it into a tangent- filled non-cohesive stack of ideas. I promise myself that I will pick one major dramatic question for my over arching dramatic plot and commit. If the readers don’t like it once I’ve finished and I feel that I’ve done a good job, then so be it. I’ll write another story and move on while growing as a writer each time. Thanks, Jami for your consoling post. Wow, you sure got my number on this one! I’m my own worst enemy, and it’s not uncommon for me to work myself into a state of total paralysis from fear of making the “wrong” decision — especially in my writing! Between my extremely analytical nature (where I want to know all the facts before deciding), over-thinking tendencies, and fear of deciding “wrong,” I definitely struggle with paralysis. So at least we know we’re not alone. 🙂 Thanks for the comment! I have just experienced all of this in the past 4.5 months while building my writer’s platform, first choosing a blog post or a website, feeling like if I make the wrong choice, I will lose my domain name and most recently what to post. The list is endless and in the end, mistakes are correctable. As a writer we expose our hearts and minds to the public and it can be a very daunting task. We have a skull to protect our brains and bones to protect our organs physically, but when we reveal our inner most thoughts the skull and skeleton will do little to protect our spirit. Gratefully, though, we do learn from mistakes, as long as we can push past the paralyzing fear. In the end if you do and you make the mistake, you can laugh, because it is never as bad as you imagine. For being exhausted after your conference, I’d say, you’re still batting 1,000! Always a pleasure Jami Gold! Great point too about how we don’t have structures to protect our inner spirit. I guess that’s what friends are for. 😀 Thanks for the comment! Yipe, Carly you got through it, it sounds like what I’ve been doing–agonizing over whether to blog, what to blog, where to blog, and I needed to: do it anyway advice from Jami Gold. Maybe I can move forward now, she says, peering around to make sure no one is watching . . . .
Shh, I won’t tell… 😉 Good luck! I have a terrible fear of failure to. I notice it more when interacting with others. I’m afraid I’ll disappoint them. I usually can’t stop the “sorry” and uncertainty until it’s already out. But you’ve got a good attitude about it. Can’t fail if our goal is to learn. Oh yes, I’m a “people pleaser” too. I think a fear of not meeting others’ expectations is why extrovert-situations are so draining for me. I don’t like disappointing people. So you’re definitely not alone. 🙂 Thanks for the comment! Before I started writing, I used to tell my business clients if they weren’t failing, they weren’t living and their business venture would die anyway. Now when I fall into the same mindset regarding my writing, I stop, take a deep breath and repeat, “I am learning and my writing will be better as a result”. Yesterday, I asked a colleague for a critique on my WIP. She ripped pieces off like a starving T-Rex, then asked if I was okay while apologizing for her harshness. I was fine – and grateful – because she was correct in her assessment. Now I can move on with clarity. It’s not failure when you’re learning. Thanks for another great post! Like I mentioned in my post about negative reviews, if we’re receiving reviews from people who don’t “get” our work, that means we’re doing a good job of getting our work out there. This is a similar situation–just as no bad reviews would mean we’re not expanding our readership enough, no failures means we’re not pushing ourselves enough. 🙂 Thanks for sharing that great insight! I love your quote! And congrats on surviving the conference. It takes so much out of an introvert to go to one of those things. Especially if you have hyper-sensitivity, as many writers do. There is no such thing as perfect. There is only the best YOU that you can be. That is what success means. Great post. And yes, all we can do is be the best US we can be–and since no one else can be us, that’s not an impossible task. 😉 Thanks for the comment! Your post couldn’t have come at a better time as I am tearing my hair out feeling like I need to build a website and a social media presence for a new pen name pronto. Sometimes in our rush to get to the destination, we forget to enjoy the process =) Great post! Your blog is an invaluable source of information and support for writers of all levels. Can’t wait to hear how the conference went. You know I’m here for you if you have any questions. 🙂 And you’re so right about enjoying the process and not being solely focused on the destination. Thanks for sharing your insights! Oh boy, does this post speak to me! I think I suffer more the fear of getting things wrong than I do the direct fear of failure. LOL. It’s why it takes me forever to write books. Thank you for this inspiring post, Jami! Also, you are SO lucky you got to see Sylvia Day speak!!! *Sob* I’m a huge fan of hers! Love Anne R. Allan’s comment. So true. Ditto! I can’t think of any aspects in my life that suffer from the “normal” fear of failure, but the “getting things wrong” style? Umm, yeah… LOL! What scares me is the idea of putting so much time and effort into a book and having it turn out to be rubbish. Yes, you learn from it, but it takes so long! But then I ask myself, what else am I going to do? I hear you. After spending over a year on the learning curve for my first novel, it’s set aside for now. I tell myself I’ll get back to it when I’m ready to make it better. So “failures” don’t have to remain so forever. 🙂 Thanks for the comment! LOL! Yep, I definitely stress about choices more in my writing life. I’m glad to know I’m not the only one. 🙂 Thanks for the comment–and I’m slowly catching up–thanks! Yep, that dress on my Facebook post was royal blue, matching the blue streak in my hair. 😉 Thanks for the comment! Wow, Jami, if this is the post you knock out when you’re brain-dead from fatigue… Just wow! I pinned your great quote!! LOL! Thanks…some might say I think too much. 😀 And thanks for sharing your insights in that link! Definitely not just you. 😀 We can easily fall into the trap of questioning ourselves on the same issue or story over and over–and that doesn’t help us move forward. Good luck and thanks for the comment! This post came at just the right time for me! I’m a huge perfectionist too, only this year I’ve just realized and put a name to some of the things that I do and the way I think. I’m still struggling to not let the perfectionist side of me get in the way of daily life, let alone writing. I love how you said that if we learn from a choice, then it isn’t really a mistake. I’m so glad this spoke to you. I’ll be honest–I like being a perfectionist. 🙂 I like caring enough about things to want to get them right. So I don’t want to get rid of that part of me, but I do have to make sure that it’s working for me and not against me, holding me back. If we can do that, we get the best of both worlds, I think. 🙂 Good luck with your struggle and finding that balance, and thanks for the comment! Sometimes, the fear of failure is greater, because some people find their self-worth in their talent, looks, etc. And when you write something that publishes, but is destroyed by critics and sells little, you can’t exactly rewrite it. This is sometimes very much a problem of striking out and not getting to bat again. Although I suppose some writers shouldn’t be too attached to a single book or series. Although I imagine being attached to a series is more understandable. Very true. I like the axiom in publishing that we can only truly fail if we quit. As you said, if we don’t give up, we can try again. That’s not to say that the rejections of our books or series won’t hurt–it will–but rejection doesn’t have to mean ultimate failure. Thanks for sharing your insights! Wonderful post, Jami. I’m sorry for the late response but I just *had* to chime in here, because this post describes me perfectly. Maybe my WIP isn’t the perfect story idea, and maybe this isn’t the perfect time in my life to be writing a novel. Maybe a lot of things aren’t “perfect.” But if I wait until everything is “perfect” before I start, then I’ll never get started at all. Maybe it would be safer that way. But how unsatisfying a life that would be. I need to keep reminding myself that the only real failure is the failure to try. But I think I like your quote better. I hope you don’t mind if I download it and use it for my desktop background? And of course! I’m glad that quote resonated with you. 🙂 Thanks for the comment!